First up is the 10,000mAh solar battery charger that we've seen sit at $26 at its lowest. It has 2A and 1A output ports so you can charge one phone or accessory faster than another, although this isn't Quick Charge. A solar panel fills up the battery when you're outdoors and an LED light is added for your camping or dark power-outage nights. It usually costs $36.99, but using coupon code 43876GNC at checkout will bring the price down to $17.99. 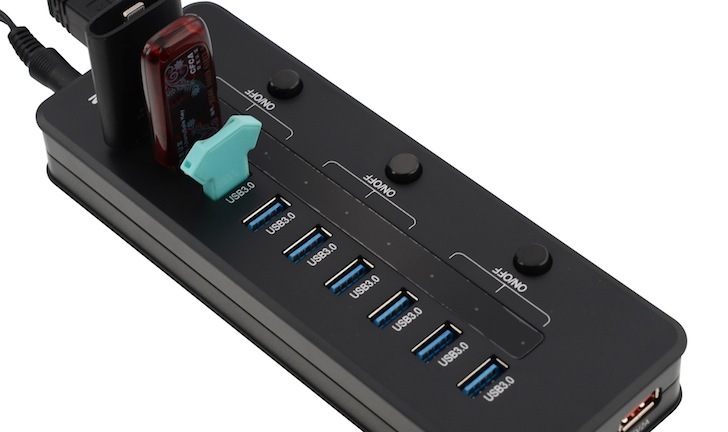 Second is this monster 10-port USB 3.0 hub for your computer. Each of these ports provide a 0.9A power output, so you could use them for slowly charging your devices or, more likely, for data transfers to USB sticks or for connecting some USB accessories. There's an additional 2.1A output port that's specifically there to charge smartphones and tablets. The hub has a surge protector, LED indicators, and switches for turning on/off groups of ports. It normally retails for $49.99 but coupon code GZ3Y6UPH will get it down to $29.99. Both products are sold by ZeroLemon but fulfilled by Amazon, so you can get free shipping if you're a Prime customer or on orders above $35. Unfortunately, it doesn't look like you can apply both coupon codes simultaneously on the same order.